The MC47 is a FET condenser microphone with two large-diaphragm capsules shockmounted on a unique parallel-swivel device that allows the capsules to be offset from 0° to ±45°. Th swivel control is marked with four numbered positions, with intermediate steps in between. There are no detents; operation from one extreme to the other is smooth. The “1” position points both capsules directly forward (0°). The “2” position rotates one capsule clockwise 15° and the other counter-clockwise 15°, creating a 30° spread. Position “3” creates a 60° spread. Position “4” creates a 90° spread (with the two capsules pointing ±45° from the LED marking the front-center of the microphone). At 90°, the two capsules produce an XY stereo pickup pattern. The mic has a 5-pin XLRM jack and is supplied with a Y-cable so that the signal from each capsule can be recorded separately. The mic therefore has two cardioid pickup options: either single capsule (at 10mV/Pa) or the sum of both, at 0° (20mV/Pa). Both capsules have 25mm diaphragms made of 3-micron polyethylene-terephtalate film (aka Mylar). The amplifier circuits are class-A transformerless, like most of Nevaton’s microphones. The mic ships in a padded hardwood box with an “isolation” mic clip and an individual frequency-response plot. 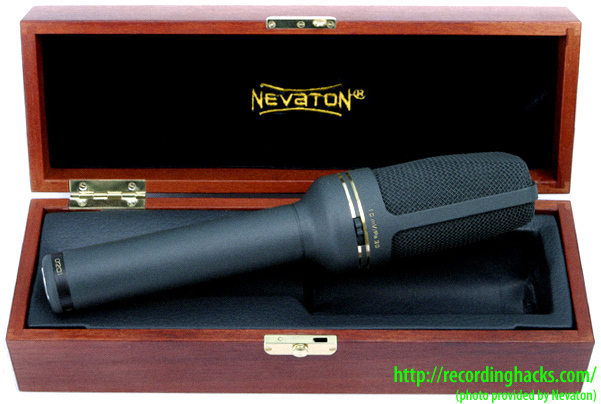 All Nevaton microphones are manufactured in St. Petersburg, Russia. 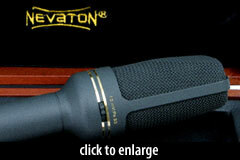 The Nevaton MC47 is also known as: MK47. The mic was released in 1987.